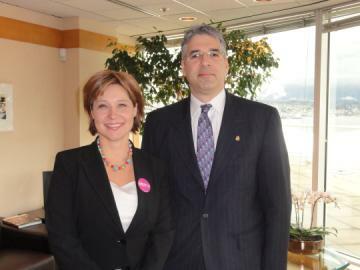 and Premier Christy Clark to make a mockery of his own work. Photo: Tom Fletcher, Black Press. Tom Stamatakis fully supports this BC Liberal manoeuvre. and the Canadian Police Association. After a year-long delay, the provincial government announced today it will create a civilian agency to investigate serious allegations against police. But its press release shows the B.C. Liberal government has thwarted a key recommendation from Thomas Braidwood. 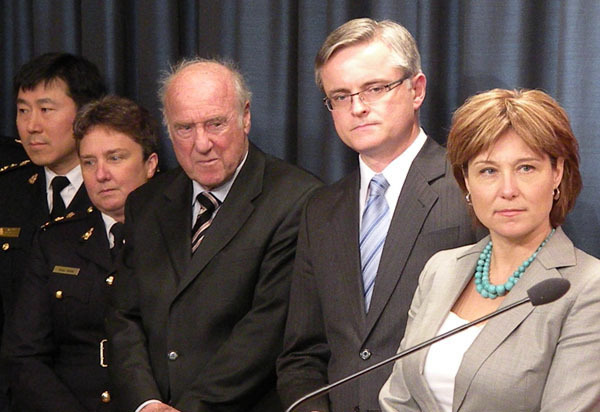 This is potentially serious enough to defeat the cause of police accountability in B.C. But that doesnt bother Braidwood at all. In fact, along with Vancouver police chief Jim Chu, North Vancouver RCMP Supt. 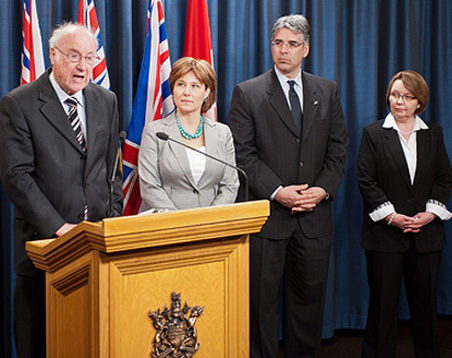 Tonia Enger and Attorney General Barry Penner, Braidwood was present at Premier Christy Clarks press conference. What accounts for Braidwoods disgraceful about-face? I think somebody got to him. This really stinks. Following his inquiry into Robert Dziekanskis Taser-related death at the hands of four RCMP officers, Braidwood recommended B.C. create a civilian agency called the Independent Investigation Office to investigate serious police incidents. Braidwood wanted the agency modelled after Ontarios Special Investigations Unit and he emphasized that the new agency should be answerable to B.C.s Ombudsperson. Braidwood no doubt knew that it took a lengthy investigation and a scathing report from Ontarios Ombudsman to keep the SIU from becoming an apologist for the police. But the government announced today that the IIO will report to the Attorney General (and therefore not the Ombudsperson, a crucial point that the mainstream media will miss). Having the IIO report to the AG is disturbing for a number of reasons. To give just one example, it was the AGs Crown attorneys who exonerated the four Mounties involved in Dziekanskis death. That was what led to Braidwoods inquiry in the first place. Furthermore by having the IIO answer to a government department, theres always the possibility of political interference in its work. Lowe and his staff answer to no one  not the Ombudsperson nor anyone else. Theres no way to determine how they handle their own responsibilities. Consider, for example, the incident in which a Vancouver police officer pushed a handicapped woman to the ground. That took place on June 9, 2010. Yet it didnt become public knowledge until over six weeks later, when the B.C. Civil Liberties Association released surveillance video and the media reported the story. Vancouver police and the OPCC then acknowledged that they learned about the incident soon after it occurred. So why did it take more than six weeks to make a public announcement, transfer the officer out of the neighbourhood and call in an outside police force to investigate? Now were told the OPCC, not the Ombudsperson, will ensure the IIO acts with transparency. What else could go wrong for the new agency? The government could neuter the IIO by starving it of funding, staffing it with people close to the police or writing ineffective legislation. One positive note is that the IIO will have the power to investigate B.C.s RCMP officers, who currently come under federal jurisdiction. But will that really change anything? One cant help wondering  because without an Ombudspersons oversight theres little to keep B.C.s new police watchdog from becoming a police lapdog. As for Thomas Braidwood, hes this years top candidate for the Richard Peck Award for Legal Establishment Integrity, awarded by B.C.s Criminal Justice Branch on the anniversary of Dziekanskis death. And, by the way, police will continue to investigate police involved in less serious incidents  with the OPCC helping cops rationalize, excuse or cover up police misconduct. B.C.’s Office of the Police Complaint Commissioner, a product of police culture, will hold the power to investigate the IIO. No one holds the power to investigate the OPCC. The IIO won’t be able to investigate allegations of sexual assault by police. In B.C., only police can investigate police for sexual assault. Why did Braidwood sell out? B.C. evidently has an especially close-knit establishment that differs, at least on police matters, from its counterpart in Ontario. Braidwood is very much part of the provinces legal elite, which includes such men of integrity as Dirk Ryneveld, Richard Peck and Stan Lowe himself. They have a lot in common, including the fact that they (and often their families) depend on the government and its agencies for very lucrative jobs, appointments, commissions and contracts. Whoever runs the government listens to an especially powerful police lobby  I think thats indicated by the fact that both the BC Liberals and the NDP, despite being at war on every other important issue, agree entirely about police issues. The B.C. Civil Liberties Association is compromised by establishment ambitions. With very few exceptions, our mainstream media couldnt care less.